This is the first in a series of blog posts that focuses on different Reston neighborhoods. It was hard to pick a place to start, there are so many amazing places to live in Reston; so much architectural diversity. I chose a place close to home... Waterview Cluster. Distance to Lake Anne Village Center: 2 - 5 minute walk. Waterview Cluster was designed in 1965 by award winning architect Chloethiel Woodard Smith. 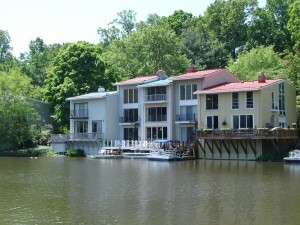 As its name implies many of the two and three story townhouse have beautiful water views of Lake Anne with the remaining situated on lushly landscaped wooded lots. The townhouses in this beautiful community have a charming mid-century modern meets cottage vibe. They are light and airy, with very inviting interior spaces. The mix of size and styles, some tall and skinny others short and square make for a unique and charming neighborhood. Like most of Reston, Waterview Cluster is very walk-able with paved walkways leading to Lake Anne Village Center and Reston Town Center. There is currently one active listing in Waterview Cluster. The Waterview residents I know are unwavering in their affection for their neighborhood; they seem to share a kind of collective recognition that they live some place unique. The links below for examples of different Waterview Cluster homes.